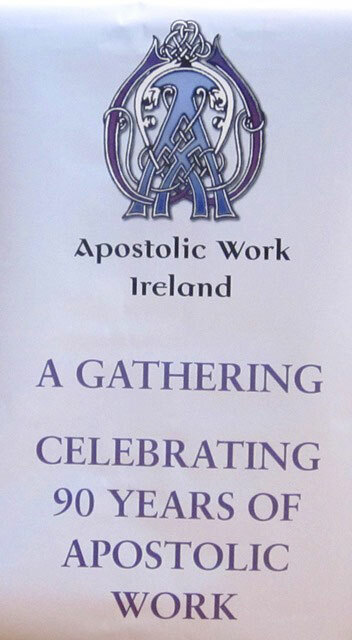 The Society of Apostolic Work was founded in 1923 by Agnes McAuley and a small band of young women who gathered in Belfast with the purpose of helping missionaries in whatever way they could – by prayer and material assistance. They began by providing Mass vestments and other things needed by the missionaries. But quite quickly they began raising funds to send to the missionaries so that they could use it to fund their work, as most of them were working with the very poor, in Africa, Asia and South America. As Patrons for Apostolic they chose St Francis Xavier (the first to preach the Gospel in the Far East) and St Therese of Lisieux, Patroness of the Missions. In choosing the latter Apostolic members were imitating her – she never left her Convent in Lisieux but offered up everything for the spread of the Gospel and for the missionaries who go from their own lands to do this work. 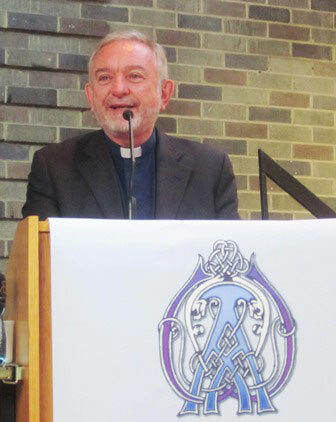 Earlier this month, the Dromantine Conference & Retreat Centre hosted a celebration for the 90th anniversary for the dioceses in the Armagh Ecclesiastical Province. Nearly 200 Apostolic members came from Armagh, Down & Connor and Kilmore to celebrate a Thanksgiving Mass and have a meal afterwards. Report and additional photos of that event here. 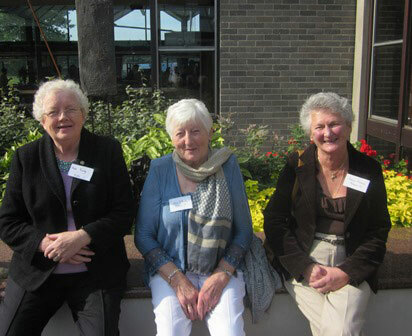 On 28 September 2013 the Apostolic Work gathered at St Patrick’s Training College in Drumcondra, Dublin to celebrate the 90th anniversary of that event. 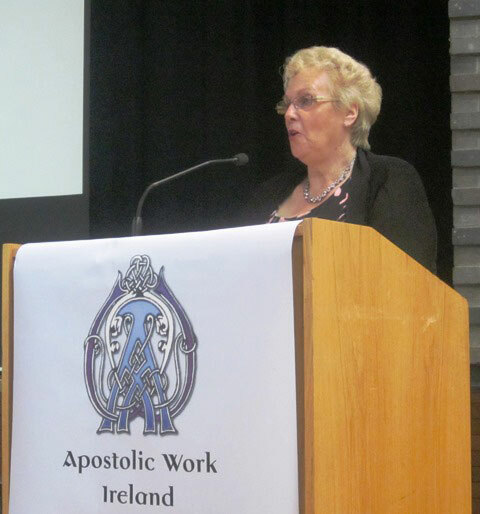 Members of Apostolic groups from all over Ireland came to listen to presentations by Baroness Nuala O’Loan DBE and Bishop Kieran O’Reilly SMA of Killaloe diocese on the role of Apostolic (and other similar groups) in an ever-changing world. 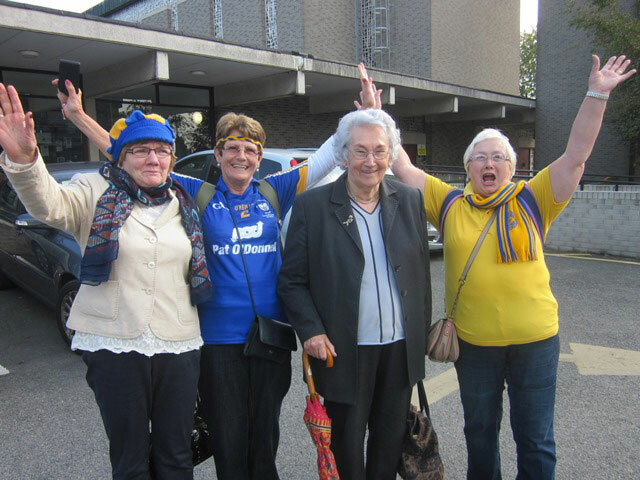 Despite the fact that the All-Ireland Senior Hurling Final replay was taking place in Croke Park that afternoon more than 40 Apostolic members from Killaloe diocese attended, though not all of them are from Clare. The Bishop of Killloe was also under some ‘pressure’ during the meeting as to which team he was supporting… as a Corkman and also bishop of much of Clare! With typical skill he replied: ‘The winners’! 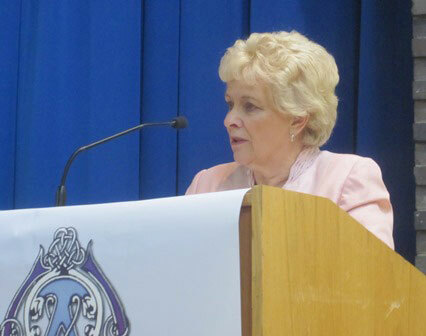 The National President of Apostolic, Mrs Anne Donaghy (pictured right), introduced both speakers. The theme for Mrs O’Loan was the ‘Relevance of Apostolic Work in the developing world today’. Mrs O’Loan spoke of the different facets of her work and especially of her work in Africa which she has visited several times to share her experience of being Police Ombudsman in Northern Ireland. In Timor Leste as well as in Sierra Leone and other African countries she met missionaries who were making good use of the materials sent to them from Apostolic branches in Ireland. Throughout her presentation it was obvious that all she does is suffused with a deep faith and commitment to the social teachings of the Church. Mass was celebrated by Fr Martin Kavanagh SMA and in the course of his homily he reminded us that ‘some give, by going; others go, by giving.’ Ireland has a proud tradition of missionaries, lay and clerical as well as development workers, who have and are giving their lives by going to all parts of the globe. But there are others – and Apostolic members to the fore among them – who go by giving of their time and work in the branches to support the missionaries who have left Ireland for other parts. The missionary activity of the Church is probably the one area of Church life which has generated the most Papal documents since the Vatican Council. “So it is a very interesting aspect of what we’re asked to engage in when you engage in your missionary participation you are right at the centre of a search to see how we can bring it to modern men and women” but this is not simply about renewing ourselves. The Council and the will of Pope John XXIII was that this Council would be a window out into the world. All the Papal documents since the Council hold fast to the principle that we never give up in proclaiming the Gospel to all, which is the basic pillar we build on. In a Question & Answer session following his presentation it was clear that Apostolic, despite an ageing membership, has no intention of folding up. Rather, the membership are anxious to respond to the new challenges they face in a confident way convinced that they have a role to play which is part and parcel of the Church’s evangelizing mission. They need to reach younger Church members and present what they do in such a way as to evoke a positive response from those they meet, during mission displays, in schools and in the local churches. Before bringing the Congress to an end there was a period for sharing ideas etc in Working groups. This was very worthwhile as it gave members the opportunity to share on the different things they are doing: to raise awareness, fundraising, how to publicise their work etc. 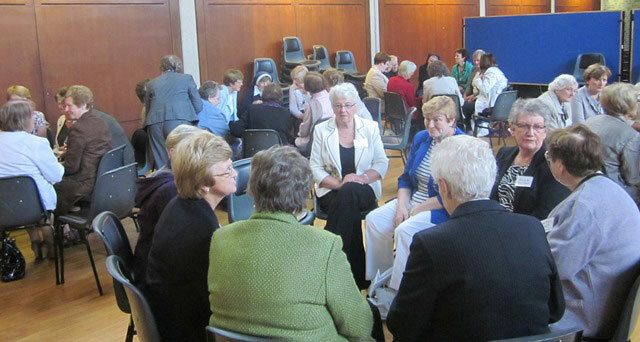 Thanks is due to Anne Donaghy and the National Council as well as Diocesan Presidents who helped in the organisation of the day, arranged transport for their members to Dublin and a very enjoyable lunch in the College. People came from many parts, including north Antrim, west Clare, Elphin and Kilkenny. The day was made all the more enjoyable for the Clare members when they met their heading off to Croke Park to win their fourth All Ireland Senior Hurling title. ‘Twas their prayers that done it lads, plus a bit of help from Shane O’Donnell! Click here for more photographs (including the Clare team) from the day.